#NasaInUasinGishu :NASA supports UasinGishu Jackson Mandago re-election bid citing to be worthy than BUZEKI. - Bana Kenya News, Real African Network Tubanane. Home featured #NasaInUasinGishu :NASA supports UasinGishu Jackson Mandago re-election bid citing to be worthy than BUZEKI. #NasaInUasinGishu :NASA supports UasinGishu Jackson Mandago re-election bid citing to be worthy than BUZEKI. NASA campaigned for the UasinGishu governor Jackson Mandago who is running for a Jubilee ticket. The first speaker at Eldoret mentioned Mandago as an eloquent and hard working Man. The NASA brigade led by the Presidential aspirant Raila Odinga said that the county has had a big step and the residents alleged not to vote for the independent candidate Zedekiah Bundotich Kiprop(BUZEKI). Mandago separately met with members of the Luhya, Luo and also Kisii communities urging them to back his bid as he dismissed claims that he was a tribalist and had in the last five years sidelined other communities in the county. “My administration has been fair to all residents of Eldoret but we want to improve and work even better because all of us have a right to live in Eldoret”, said Mandago when the members of the Luhya community at West Social Hall on Tuesday. Opinion polls have put Buzeki in the lead with about 54.2 percent of support against Mandago’s 42.2 percent and the millionaire businessman is perceived to have the backing from both the Kalenjin and non-Kalenjin tribes in Uasin Gishu. 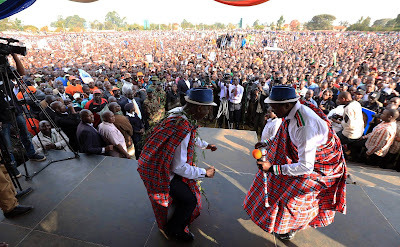 However, Mandago dismissed the polls as fake insisting that he enjoys more than 70 percent support in Eldoret and other areas inhabited mainly by the non-Kalenjin communities. “My opponents spread a lot of propaganda against me but I have now known what to do. I wipe out the false claims as soon they are circulated and my support all over the county remains intact”, said Mandago. Mandago said circulation of hate leaflets portraying him as a tribalist was one of the schemes being used by his rivals. He wants those involved arrested and prosecuted and asked communities in the town to stay put as they will be safe. "NASA in Eldoret: 64 Stadium, Amazing indeed, Truly the Rift has shifted, Change is inevitable." Kalonzo Musyoka Quotes. The NASA team also campaigned for Mandago re-election bid citing that he has the abilities to lead the County far. The NASA team agreed to assist the people of Uasin Gishu in building better and international standard sports grounds across the County.